With its distinctive photography, entertaining fishing tales and bows to Julia Childs and M.F.K. Fisher, Trout invites readers to enjoy this book. Tennant, whose experience is as a game cook and author of several books in Willow Creek Press’s The Game and Fish Mastery Library, reinvents classical dishes into a pared down sophisticated collection. The twenty-four recipes show off different varieties of trout paired with their best cooking methods. Smoking Rainbows, Trout en Papillote Nicoise (parchment paper roasted), Irish Poached Trout in Sorrel Court Bouillon, Chinese Basket Trout Steamed with Ginger and Scallion Sauce and Saute of Trout Amandine are some of the offerings. Tennant’s recipe writing, however, occasionally stumbles, as if he is venturing into territory in which he is not completely comfortable. In the appetizing Water Angels of Soo-Chow, the recipe instructs the cook to whip the egg whites for the fish coating before heating the oil in which to deep-fry the fish. Julia and M.F.K. might suggest to Tennant that egg whites should wait for no one and will lose their loft on standing. Also, the inclusion of serving amounts would have been helpful. Despite this, the recipes in this beautiful book are creative and mouthwatering. Tennant is on very solid ground with the photographs of Grilled Brook Trout with Barbados Fruit Splash and Rainbow Wrap. They will send fish lovers into shivers of delight. 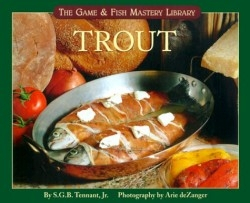 Fishing enthusiasts as well as non-fishing minded readers will be attracted and absorbed by Tennant’s entertaining and enlightening trout stories. Although the reader must step lightly between the occasional uneven cooking information, the photographs and stories alone are worthwhile.